When I started liveblogging my birthday on Friday, I wasn't expecting a crime drama before breakfast. I popped out for a newspaper, and thought I'd top up my cash reserves because I was getting low. Here's the cashpoint I went to. 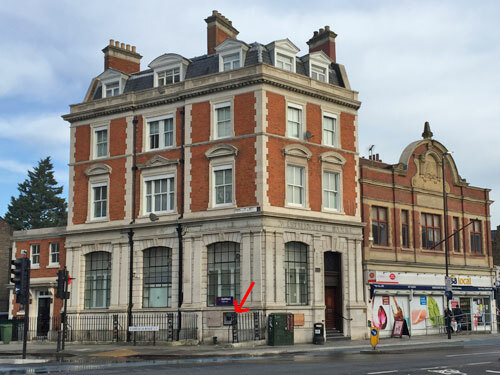 It's at the former National Westminster Bank on Bow Road, a lovely old building on the corner with Fairfield Road. Nat West closed this branch last year. There used to be two cashpoints, but one of the pair has since been covered over. I used the other one. I've been using it since 2001, and never had any trouble... not until Friday. Nobody else was using the cashpoint when I arrived. I remember being pleased that nobody else was around. I looked into the slot before I used the machine, like you're supposed to, to see if anything suspicious appeared to be attached. It didn't look suspicious. So I put my card in. First I entered my PIN. I attempted to cover the keypad, but not so scrupulously as to block it from every angle. It's always hard to know what angle to shield it from, be that from above, or to one side, or from someone stood immediately behind. I didn't think there was anybody standing behind me - there hadn't been when I moved in to use the machine - but of course anything could have happened in the few seconds I hadn't been looking. I requested some money. The machine whirred a bit, then seemed to be trying to eject my card from the slot. It failed. It tried again, and failed again. It tried again, and failed again, at which point an Out of Order message flashed up on the screen. Damn, I thought, that's the last I'll ever see of that card, and how am I going to get any cash now, and happy birthday to me. A young man appeared behind me shortly afterwards, or maybe he'd been there for a while. We had a conversation which consisted of me saying the machine was out of order and him saying something I didn't understand. He went away. I waited. Nothing happened. A different young man appeared and we had a similar conversation, both incomprehensible and brief. He too went away. I'm being helpful here, I thought, telling all these would-be users not to bother. I did what you're supposed to do and rang my bank. Unfortunately I haven't rung my bank from my mobile for several years, and the number in my phone was incorrect. A recorded message told me what the correct number was, but I didn't have anything to write it down with, and I couldn't type it into my phone because I was already using that. OK, I thought, this'll be easier done from home. Home's less than four minutes away, what's the worst that can happen in that time? I took a photo of the machine, because I thought that might be useful, and headed off. Walking back past the supermarket, I noticed the second man I'd spoken to standing outside. I can still picture him - about twenty-ish, medium build, below average height, dark hair. I looked at him and he looked at me, but I only realised the second part later. And home I went. I Googled the telephone number you're supposed to ring in case of a lost card, which is a lot easier to do on a laptop than a mobile. I rang the number, and was annoyed when the first minute of the call was taken up by a message about fraud and how important it was to avoid it. I'm trying to ring you as quickly as possible, I thought, and all you're doing is increasing the chance of the thing you're warning me about actually happening. The first thing I was asked for was my sort code and account number. They're written on my card, I said, which I no longer have. I nearly remembered them both, but not quite, which wasn't good enough. Thankfully I was at home so could go and look them both up on a bank statement. Had I still been standing in the street, this would have been rather trickier. The nice woman in the call centre swiftly cancelled my card, so that was good. What wasn't going to be good was waiting 5 to 7 working days for the arrival of a replacement, because that potentially meant two cardless weekends. Don't worry, she said, you can go to a local branch with photo ID to get money out, and was there anything else we can help you with? Indeed there was. During the call I'd fired up my account online, to check what was going on, and spotted several unexpected transactions dated 9th March. First there was the money I'd been trying to take out, which had been deducted from my account even though I hadn't received it. Then there was a withdrawal of £80, which I hadn't made. Then there was another withdrawal of £80, which I hadn't made. Then there was an attempted withdrawal of £40, which had been refused. And finally there was an attempted withdrawal of £10, which had been refused. What's all that about, I asked. Had I been looking at my mobile during this call I'd have seen that my bank were trying to contact me. They'd sent a text message ten minutes after I put my card in the machine, and another one minute later detailing suspicious activity on my account, and then tried ringing me 10 minutes later, and they'd left an automated voicemail message. By this point they were ringing about a card I'd already cancelled, but I can't fault them for a) noticing suspicious activity b) preventing the third and fourth withdrawals c) informing me about it. The bank's text message included considerable detail about what my skimmer had tried to do. He hadn't used the cash machine I'd lost my card in, he'd used the cash machine twenty seconds walk away outside the supermarket. He'd been making those withdrawals very shortly after I'd left to walk home. He was clearly trying to withdraw money strategically in chunks, nudging closer to my daily maximum limit. Once it was clear the machine was refusing his requests he went straight inside the supermarket and tried to use the card there. I don't know what costs £56, but my bank refused that transaction too. Thwarted, he went back outside and tried for £10 and that also failed, at which point he must have given up. We'll try and get those rogue payments refunded, said the nice woman on the phone. Some of them should be straight forward, but our fraud team might also be in touch, so please tell them what they need to know. And that was that. Obviously what I did next was to go back to the cash machine. Oddly it was no longer Out of Service and seemed to be operating normally. I had a look in the slot, which looked normal, and took another photo for good measure. Then I went into the supermarket and asked what they knew, but the man behind the counter said he hadn't been on shift at the time, and if CCTV footage was ever needed I'd have to contact their independent security company. I wish I'd taken a better 'before' photo, because it's a bit blurry, but it does look like there was 'something' inside that slot. It's some kind of thin plastic sheet, with a lighter coloured strip in the middle like a piece of folded tape. I didn't notice it at the time, and I think that's because I never knew what 'normal' was supposed to look like. Having been back, normal is an angled slot top and bottom, all in green plastic. But I had no means of comparison, and never spotted the subtle infill, and so poked my card in as normal. You tell me this device is a 'Lebanese loop', a plastic or metal sleeve inserted into the slot which causes cards to be retained. All is normal up to the counting of the money, but when the ATM tries to eject the card it catches against a flap, possibly repeatedly, and is then drawn back into the machine. To the user it appears the card has been retained, but if they walk away it can be retrieved later and the loop removed. So long as the PIN has been noted, somehow, the card can then be used to drain the account, at least until someone notices. Within a couple of hours I managed to get some cash out from a branch of my bank in Stratford, so that was fine. Both of the fraudulent £80 withdrawals were refunded to my account before the end of the day, which was great. What I haven't yet had refunded is the amount of money I was trying to take out of the machine in the first place, but it's early days. And I remain cardless, possibly until Tuesday of next week, which is cramping my ability to buy stuff somewhat. And I mention all of this in case it prevents the same thing happening to you. 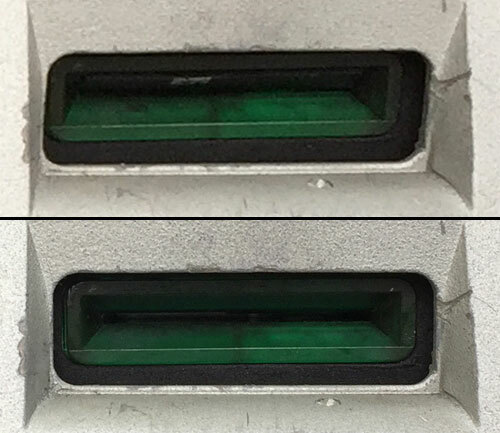 Take a good look at what a 'normal' card slot looks like, next time you use a machine, so you'll be better able to spot when something isn't right. Be sure to screen your PIN as you enter it, even if you don't think anybody could be watching. And make sure you have an up-to-date number for your bank in your phone - ideally the special number you're supposed to ring for lost or stolen cards. A heck of a lot can happen while you're walking home and Googling a phone number, so best be prepared, and wide awake.